As promised, here’s a photo from the other night. 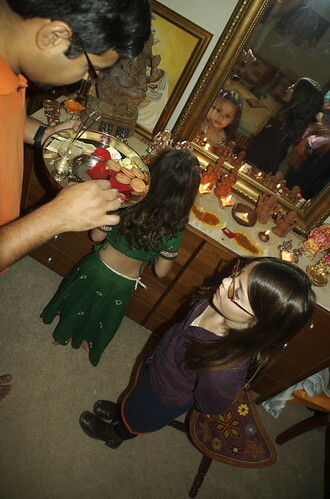 We celebrated Diwali with our dear friends Rishi and Meredith, and it was truly magical. A perfect evening filled with tradition, good company, spicy food, and delicious wine. Diwali is the festival of lights… from Hindu mythology it is the night that Lord Ram returned home from a 14 year exile during which he defeated the demon king Ravana. Hindu festivals follow the lunar calendar – Diwali is always on a moon-less night – hence the lights to show the way home. The puja (prayer) in the picture is to Lakshmi (goddess of wealth) and Ganesh (god of auspicious beginings). I feel so lucky to have been able to share in this wonderful evening with our friends. Thanks again, R&M! !